Okay guys. In many of my projects, I use salvaged or reclaimed wood. It was brought to my attention that not everyone has a dad who keeps everything that might have a potential purpose in the future, like I do. Most of the free wood that I use comes from my father’s ever-growing wood pile. With that said, I’d like to share some places that I find free wood, and many other options that are available to the public. Here at Salvage Seattle, I am all about recycling and giving life to something that would otherwise be thrown out. Therefore, I have a wide variety of places that I acquire free wood and furniture alike. Below, I will help you explore some of these incredible options! Associates – Even though most people don’t have access to a wood pile like my dad has, many people do. Ask the people you know if anyone has any wood lying around that they’d like to get rid of….it might surprise you what people horde in their backyard. But I must say, make sure to be specific about what you’re looking for. If you need lumber that has been cut and manufactured, say so! You don’t want to arrive to a pile of chopped firewood from a fallen tree. That would be pretty hard to turn into a beautiful project. Unless of course, you’re extremely creative and have more patience than the average person. Craigslist – Another great resource is CRAIGSLIST. Most commonly known as a place to buy and sell items. But, most have not wandered over to the “free” tab under the “for sale” category. There is always a large variety of free items on this page, but you can always narrow your search for lumber/wood or whatever you happen to be looking for. Refer to my post about safety precautions to use when buying/acquiring items from strangers. SEE THAT HERE. Yard/Garage Sales – Many people take advantage of a yard or garage sale to get rid of scrap wood they have no need for. And a lot of the time, you can get them to give it away for free if you agree to haul away the entire load….just make sure you have an appropriate place to store all of it in the mean time. FreeCycle – A website that I recently discovered is FREECYCLE. Here you can find lots of various items (including wood and supplies) that people need to get rid of! You can also post a wanted ad for wood here as well! That way, people can inform you if they have what you are looking for. This is great for the lazy-looker! 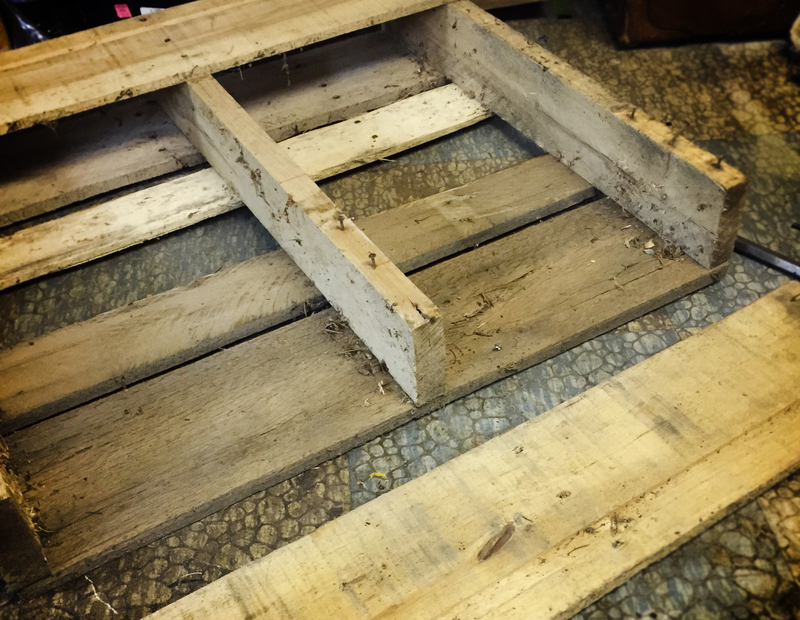 Wood Shipping Pallets – You can find free wood pallets like the deconstructed one in the picture above at many large stores. Especially hardware stores! Just ask a manager if they have any you can take off their hands. Usually they’re in the back of the parking lot somewhere. But, it’s always a good idea to ask before you take your pick of them. Also, make sure to take a good look at each one before you take them. Avoid any that are discolored, moldy, or have a funny oder. Some pallets can have chemicals spilled on them during shipping. CHEAP NEW WOOD – I hate to add this section, since there is so much wood waiting to e salvaged. But, I understand that some projects or individuals may require new wood for a project. In that case, there is a great and cheap option that I recommend. Hardware stores such as Home Depot sell wood by the foot, so there are always scraps left over after they cut it for you. These scraps are kept in a pile in the back of the wood isles. They sell these smaller pieces for next to nothing! Check it out if you’re looking for new wood, because these will eventually be discarded if no one buys them. Now that you know where to find your free wood, get to salvaging! And don’t forget to tell me about your adventures and or projects in the comment section below!